The sums received by CEOs at Dish Network, DirecTV, and Comcast (in order) reflect a more balanced ratio of compensation to corporate financial results than most other top-tier media barons, according to The Carmel Group’s new “Media Executive and Company Ratings Report.” (www.carmelgroup.com). The study shows that among ten of the largest publicly-traded media companies analyzed, CBS and Discovery Communications get the least CEO bang for the buck. The Carmel Group’s performance study also rates, alphabetically, Disney, Time Warner, Time Warner Cable, Viacom, and 21st Century Fox. It includes hundreds of data points, graphics, and additional analysis and projections. Findings from the composite study and analysis for the years 2012 to 2014 identify the top performers and compound annual growth (CAGR) in the U.S. media sector. This group of ten companies accounts for $56 billion in average 2014 year-end equity. Financial metrics measured include average compensation, revenues, net income, earnings per share (EPS), market capitalization, and equity. Patents and other “innovation” benchmarks, as well as social and charitable contributions, were also considered. During the three years studied, overall revenues for the ten companies grew at 3.5%, while the annual CEO compensation grew at 13% compounded annually, which matches the net income and market capitalization growth for the period. DISH’s Ergen (age 62) averaged $1.7 million annual compensation, CBS’ Leslie Moonves (65) averaged $62 million, and Discovery’s David Zaslav (55) averaged $79 million during the three-year period. DirecTV’s White (62), with $17 million annually, received 10 times the compensation of Ergen. That said, Ergen’s shareholdings vastly increase his net worth. The overall study outliers were Messieurs Ergen, Moonves, and Zaslav. The average age of the ten CEOs is 62; the average number of years experience is nearly 17. At over 150 patents, Disney more than doubled the average number of 2012-2014 patents achieved by its next closest U.S. media rival. The Carmel Group’s mid-year 2015 study, titled “Media Executive and Company Ratings Report”, includes research, charts, and analysis by M. Ben Jebara, PhD candidate at the University of Toledo, Ohio. For a full report, contact The Carmel Group at jimmy@carmelgroup.com, or 831 622 1111. The study price is $299. Satellite 2010: Competitive Challenges By The Carmel Group’s Jimmy Schaeffler A handful of competitive developments emerged from the Satellite 2010 conference held March 15-18 in the Gaylord National Conference center, just south of Washington, DC, within the newly-built National Harbor facility. Several are worth noting for broadcasters, cablecasters, mobilecasters, and other actual or would-be opponents (or allies?) of satellite-based content providers. 3DTV: This application, born decades ago in miscellaneous random theatres, and started and restarted tortuously over and again, seems finally to have found its legs, albeit admittedly short ones for now. Revived by the creative genius of Hollywood directors such as James Cameron, in his epic Avatar, and Tim Burton, in his spellbinding Alice In Wonderland, 3DTV was a topic that often found the stage at the conference’s sessions. For commercial satellite content distributors such as industry leaders SES and Intelsat, 3DTV holds much promise to give viewers globally yet another reason to watch the video services they deliver (or help deliver) to those 100s of millions of cable, broadcasting, and satellite customers around the world. It also increases the bandwidth demand, which means improved revenues for these fixed satellite service (FSS) providers. Just as HDTV has helped these FSS providers weather the economic storms of the past two years, so, too, do many in this industry subsector see 3DTV doing the same further into the next decade. Possible impediments include: finding agreeable industry standards, getting more hardware into homes, and getting more content produced in the 3DTV format. Telcos Rising: Outside the satellite show conference facilities, from TVs found in public places and hotel rooms, advertisements constantly touted the telcos’ positioning in the race among satellite and cable providers for the video souls of millions of would-be disloyal pay TV subscribers. Indeed, the prediction of The Carmel Group at last year’s 2009 Ohio Cable Association show in Columbus — that one of the top future concerns cable operators would face would be in the form of competitive bundles and better deals offered by once-asleep telephone companies — has risen like a phoenix in metropolitan areas like greater WDC. 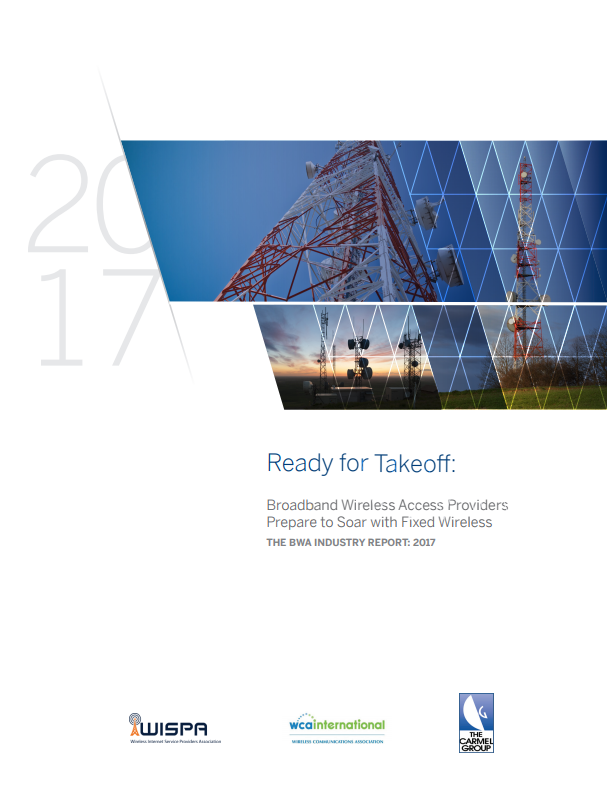 Possible impediments include: not enough revenues from any form of wireline service over a short enough period of time needed to support telcos’ spending and future expansions, and concerns over renewed competition from cable and satellite providers. O3B: This broadband-by-satellite venture has recently received a rather rare $75 mil. cash and in-kind infusion from industry giant, the Luxembourg-headquartered SES (Euronext Paris and Luxembourg Stock Exchanges: SESG). O3B stands for the “other three billion,” a reference to a bit less than half of the world’s population that do not receive Internet services where they live today, focused on Africa and South America. O3B is SES’ intent to not only enlighten these masses, but to also acquire hard-fought access to this huge base of would-be subscribers and targets of advertising. Other investors in O3B include Google, Liberty Global, HSBC, and North Bridge Venture Partners. Details of a recent press release include: “O3B is building the world’s first ultra-low latency, fiber speed satellite network to serve as a global internet backbone and next generation backhaul infrastructure for people and businesses in emerging markets. The company will be able to combine the speed of a fiber network with the global reach of a satellite system, and will partner with telecommunications providers and internet service providers (ISPs) to serve billions.” (See, http://www.ses-astra.com/business/en/news-events/press-archive/2009/09-11-16/index.php). Possible impediments include: like the telcos’ video investment, O3B faces possible returns on investment and low telco client growth, that together fail to support continued investment at levels needed to properly launch such an ambitious global project, as well as land-based competition (once those possible land-based competitors notice the possible successes of O3B). 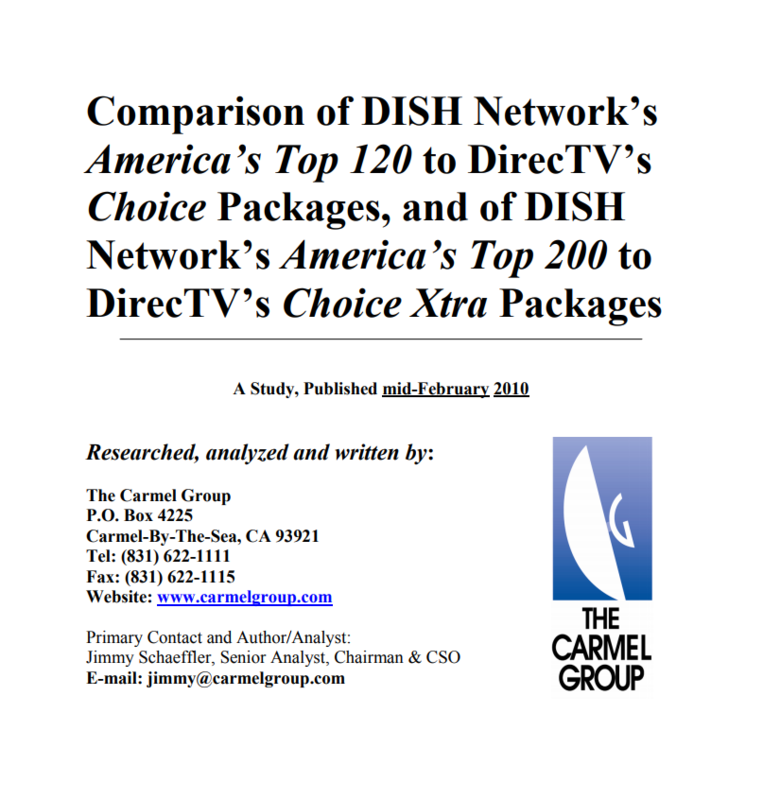 The Carmel Group was asked to measure and compare the content and pricing of the two basic level pay TV packages, and the two mid-level packages, offered as of mid-February 2010, by DISH Network and DirecTV. 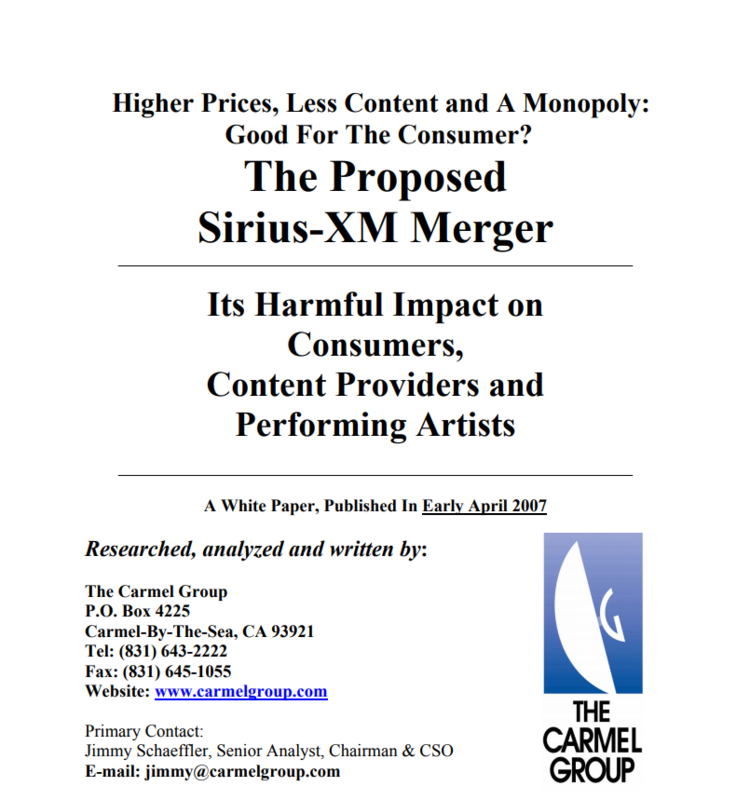 This study outlines the opposition to and the dire consequences from this so-called “merger,” especially as it impacts consumers, content providers and performing artists. This paper also contains numerous alternative recommendations for these companies and the future of satellite radio. This comprehensive 2007 study is the product of three of The Carmel Group’s in-house databases. First is The Carmel Group’s historical archive, dating back to 1997-1998, when The Carmel Group was the first consultant/analyst globally to produce industry projections concerning the U.S. Digital Video Recorder (DVR) industry. Second is the combined historical data compiled from two surveys conducted in 2005 and 2006. The data collected by The Carmel Group in May 2005 was based upon surveys of 2,586 U.S. respondents; the 2006 data collected by The Carmel Group was based upon surveys of nearly 1,800 U.S. respondents in January and February of that year. And finally, we focus on the current data from almost 2,200 U.S. respondents, from our 2007 survey that was run during February-March 2007. In both the 2006 and 2007 surveys covering the DVR and related industries, 76% were identified as DVR-Users, while 24% were Non DVR-Users. Also, in both those years, The Carmel Group received responses from respondents representing every state of the union and several U.S. territories. In addition, The Carmel Group interviewed dozens of key industry participants, focused on the developers and manufacturers of existing DVR products and services.